“Apart from my parents, my teachers have done the most to shape my life.” ~ George Lucas, filmmaker. What would any dancer be without his dance teachers? Of course, he wouldn’t be a dancer at all. Not in any formal sense, anyway. Dancers are captivated, shaped, nurtured, and released into the dance world by dance teachers. And top dancers often have superb dance teachers to thank for their success. 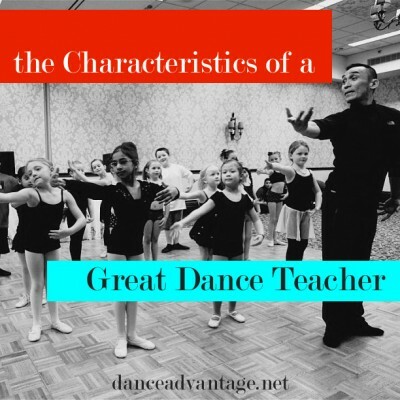 So what are the qualities of a great dance teacher? This is our list. If you agree, disagree, or want to add to it, please comment and share the post so that others can do the same. Modified photo courtesy Francisco Gella Dance Works. The best dance teachers breathe dance in and out like oxygen. Dance is not the only thing in the teacher’s life but it is safe to say she immerses herself in dance and is compelled to share this fascination with others. 2. Loves and honors teaching. Beyond the compulsion to share what they love with others, great dance teachers are enthralled with the art and act of teaching. They revere the craft and their role as a teacher. Because of this, a great teacher keeps working and learning to develop his teaching skills and is dedicated to providing the highest quality experience to his students. 3. Has been there and keeps going. A great dance teacher knows and remembers what it’s like to be a student. She’s developed and mastered the skills she is passing on to you and yet, doesn’t stop there. She is not content to rest on her knowledge. Great dance teachers are sensitive to the needs of each dance student, regardless of ability or innate talent, and works to find the best way to encourage each pupil. A great dance teacher believes in you, encourages you, cheers your successes, and helps you understand and correct your mistakes. Support from a dance teacher often involves pushing and pulling. A great teacher challenges you and inspires you. One way or another, he will find a way to lead you to your full potential. A terrific teacher is not just sensitive to your needs but appreciates your individuality and humanity. While she may be beyond you in knowledge of dance, she shows deep consideration for your feelings, your thoughts, your body, and your progress. She expects you to progress and do your best, and resists giving up on you even when you fail to meet those expectations. You might also say she loves students as much as she loves dance and teaching. 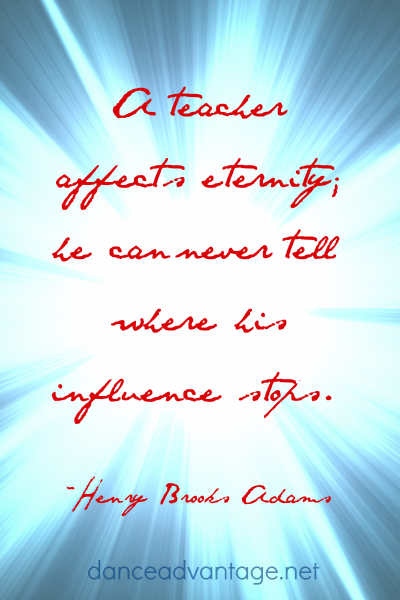 It is possible to learn from negative or discouraging teachers, but a great teacher inspires because he cares. It doesn’t mean he’s a push-over. It means he responds to his students with understanding and, when appropriate, compassion. He reaches people where they are, not where he wants them to be. 8. Adapts and is flexible. Great teachers are ready and willing to go off-track to nurture your train of thought. They empower students by teaching them to think and sometimes direct the learning. A great teacher knows when she’s lost her students and will always try new ways to help them recover, discover, and understand. 9. Cultivates and cares about your health. Your physical and mental health are crucial to your success as a dancer. A fantastic dance teacher will keep up with the latest and best information on safe teaching practices. He will also stop at nothing to keep the classroom a safe space to try, fail, and grow. 10. Leads a process of discovery. All dance teachers should have a method to their madness – usually one that is born of trial and experience. Good teachers study and strive to create a curriculum or process to guide students with logical standards, goals and objectives. The best teachers create space in that process for questions, exploration, and problem-solving. 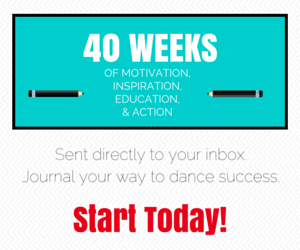 They want you to be a thinking and self-motivated dancer. 11. Speaks to every student. It is a special gift of dance teachers to be able to translate movement concepts into a language that makes sense to students. A great dance teacher communicates concepts over and over in multiple ways until everyone understands. It is worth it to him to attempt to reach every student because he feels every dance student is worthy of his best. The best dance teachers are like planets with their own atmosphere. The students gravitating around such teachers become part of a unique culture that seeks to bring out the best in everyone breathing the same air. A teacher who creates such a community teaches more than just dance. She instructs students to live as better people. Fabulous article! So true! I would add that a great dance teacher inspires her students unique creative expression to blossom, understands posture and alignment and most importantly performs on a regular basis! As dance is a performing art, a teacher who inspires students to perform is allowing her students to challenge themselves to not only be their very best but to also shine on stage! I mostly agree, Andrea. In my opinion, though performing on a regular basis is not actually a necessary trait. I’ve had many wonderful teachers who no longer perform. Age or stage of life is often a factor there and I could never discount the amazing instruction I’ve received from those who are not current performers. This is an excellent list, Nichelle. I *think* I do much of this as a teacher but only my students know for sure. I basically teach the way I wish I’d been taught. I didn’t have a lot of empathetic teachers when I was growing up but found a few wonderful souls when I got older. Thanks Leigh! I wish I could say I am all of these things all the time but it wouldn’t be true. It’s something to aspire to as well as look for in teachers. It’s been interesting to see which people have felt are most important on this list. The definition of a great teacher is going to be slightly different for everyone as dancers respond to different things. And that comes through in our teaching, as you mentioned: emulating or avoiding the ways in which we were taught ourselves. Really appreciate the article and both of my instructors embodies the traits mentioned, but one thing that to this day still bothers me is that not every instructor or student is a female. I realize that at being at a non professional level the ballet world is predominately female but there are guys like myself out there and do read articles that are ballet related. Kini, I’m glad you appreciated the article. But I wonder if you read the whole thing? She and he are used interchangeably throughout. When placed in conflicting situations as a dance teacher I often think, “What would (my teacher/s) have said to me about this.” They were patient and kind, but they also knew JUST how much to push me outside my comfort zone to become better, as a dancer and as a fledgling teacher “back in the day” when I started with my own classes. As a teacher, I also believe that constant and consistent professional development in the form of classes/workshops/seminars/reading is also crucial to allowing us to continue in this wonderful industry. Thank you for the article! Thanks Sam, for your lovely and supportive comment. I think you make a great point about how a great dance teacher is able to motivate you. My dad was on a touring ballroom team in college that went to England to compete internationally. It was important that their team’s instructors were able to keep everyone motivated through their dance lessons and routines. Having someone that is willing to guide and even push you to your peak can be important to develop your talent and technique. I am looking for a story I heard years ago about a dance instructor who told an aspiring dancer that she did not have what it takes to be a professional dancer. The aspiring dancer gave up dancing, and was unfulfilled in her life. Years later, she encountered the instructor and confronted him that he ruined her life with his statement that she didn’t have what it takes. He responded, “I tell everyone that, the ones who don’t listen and pursue dancing anyway are the ones who become professional dancers”. I would love to cite this story with permission in a book I am writing. Thanks. I recall being told on multiple occasions by multiple teachers that I was not likely to make a career for myself in dance. I learned over subsequent years that all of my professional colleagues heard the same thing from their teachers as well. Now the question here seems to be: Are the teachers doing as was suggested in the above story by provoking students into perusing their goals through reverse psychology? I personally doubt that is the case. So what is going on here? Now that I am on the other side of the conversation, I’m seeing things in a different light. I have observed that young people, with all their insecurities, are all too willing to twist honest critique into outright dismissal of their talents. Each dancer, wether a student or a working professional, has issues that stand between them and their goals. As a result they receive rapid fire criticism on a constant and ongoing basis as long as they continue to dance. Critique is an essential part of the learning process. Some very strong individuals can take the critique for what it is and move on the to next step toward improvement. The majority of people however, especially young people, have not learned the value of criticism as a constructive mechanism. Since most people never experience critique in the volume and frequency as a dancer does, their response is to become emotionally defensive. This defensive stance then evolves into a certainty that their teachers don’t like them or don’t believe in them. I personally became determined to prove the doubters wrong and I ultimately did so. In retrospect I am starting to wonder if it all happened the way I remember it. Did my teachers really say hurtful things and express doubts the way it sticks in my mind? Or were they saying other more important things that I was unable to comprehend fully? Did I twist their words because of my defensive emotional stance? Perhaps we will never know. More importantly however, this all underscores the importance for teachers of dance to be mindful of their words and how they use them. Especially when providing critical guidance to a vulnerable student. I think that believing and inspiring the students should be put on there too. A lovely and well written article. Your use of quotes to summarise each point is so thoughtful. Anyone can call themselves a dance teacher, but not everyone has the skills, experience, qualifications and aptitude to be an effective teacher of dance. A dance teacher choreographs a few moves and expects students to blindly follow suit. A teacher of dance can mold the most awkward of beginners into skilled professionals that can proudly showcase their craft to the world. A dance teacher may have little experience. A teacher of dance has many years of correct and proper dance training behind them, gone on to full time academies, have professional experience in their art, studied the foundations, put in the hard yards and have a genuine love to pass on what they have learned to the next generation of starlets. A dance teacher will try to be everyone’s best friend. A teacher of dance will be everyone’s best teacher, will provide stability, the right training techniques and right equipment for their students. A dance teacher will often try and push their students into being what they failed to be. A teacher of dance will push their students to be the best that they can be because they’ve been there and done it already. A dance teacher will say a teacher of dance is too serious, or no fun. A teacher of dance will scratch their head and plie. I love to dance and would love for my daughters to discover the same passion. I am looking for information concerning what makes a good dance teacher. I like the point mentioned about motivating dancers. Another element I find beneficial would be the capacity of giving constructive criticism. 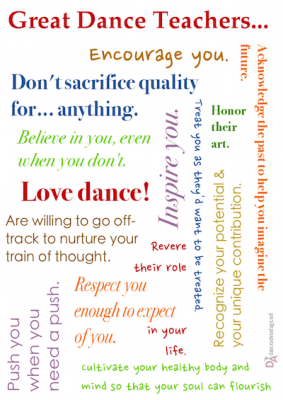 I appreciate this information about the traits of terrific dance teachers. It is good to know that the teacher should really love dance. I like what was said about the best dance teachers breathing dance in and out like oxygen. Something to consider would be to find someone local to facilitate weekly lessons through a more convenient commute. Your article made me smile! I am sure I am not the only one who read this article and found themselves appreciating their current teachers even more, while also taking a moment to miss those teachers who have touched their lives and with whom they no longer dance. Your point about dance teachers adapting to students’ needs and readily helping them recover and discover dance also resonated with me. Good teachers should understand and accept the fact that every dancer has different goals. Regardless of the dancer’s goals or technique level, he or she owes their students their very best, both instructionally and personally.